Thrifting is usually not the best in the dead of winter in northern Minnesota! People just aren't moving to new houses, downsizing and moving to an apartment or cleaning out closets! Too much cold and snow. One of these recent purchases gets a makeover today on my blog! 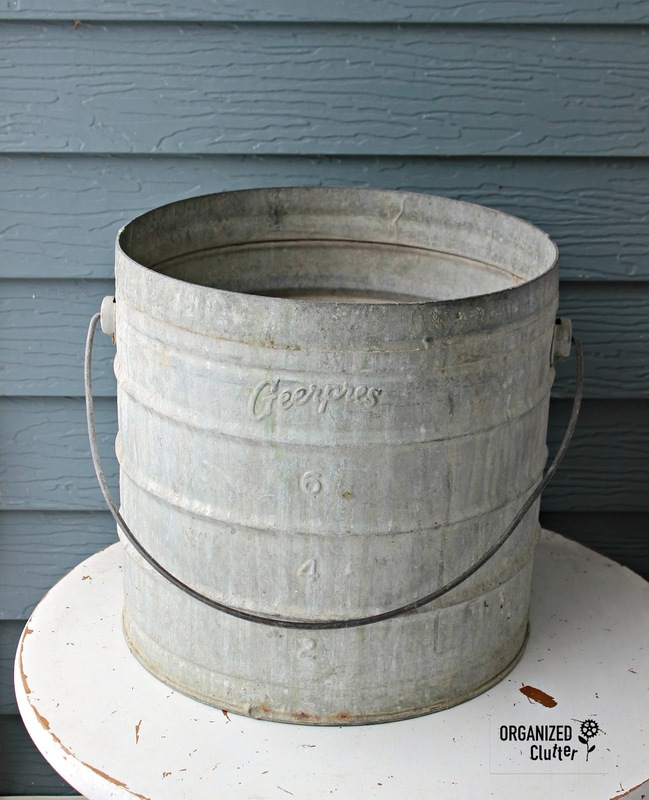 I found this really big Geerpres scrub bucket. I love the patina! Thinking outside in the garden someplace. 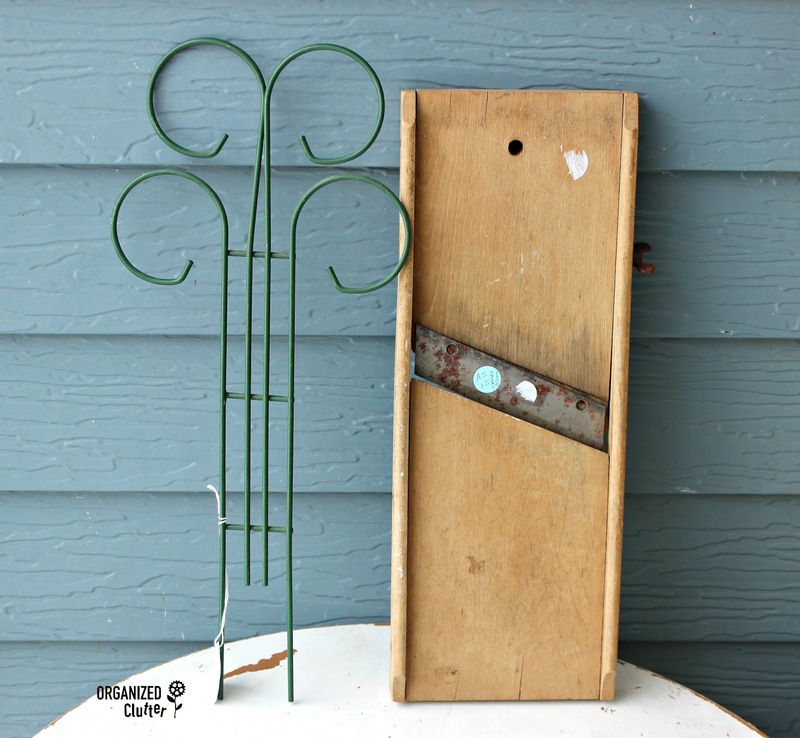 I also purchased a small plant trellis and a vintage slaw cutter. I think I can find projects for these items. 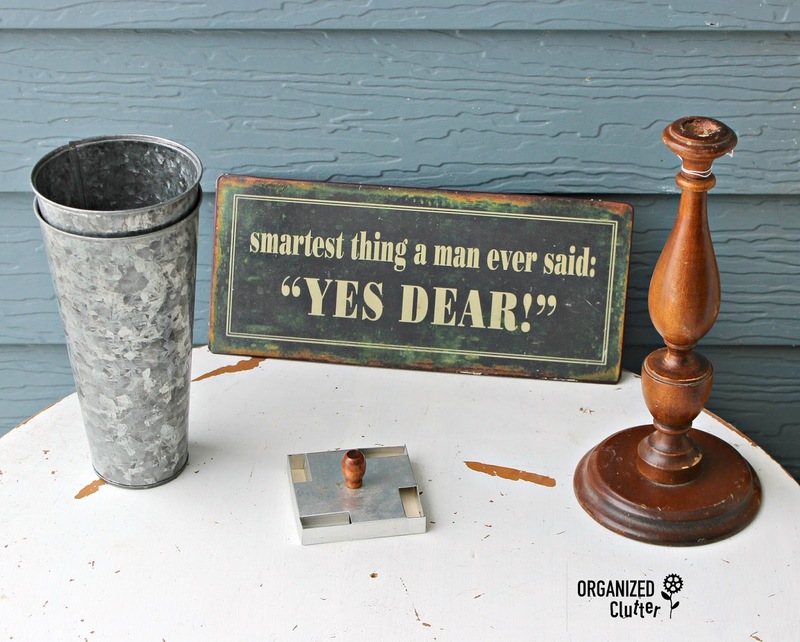 I also found two tall galvanized vases, a metal sign, a wooden candlestick and a tart cutter. I will more than likely try to age the vases, repaint the sign (even though the saying is pretty good), not sure on the tart cutter yet, but I always find uses for candlesticks. I also found a red oil can. I think it will look great in my junk gardens. 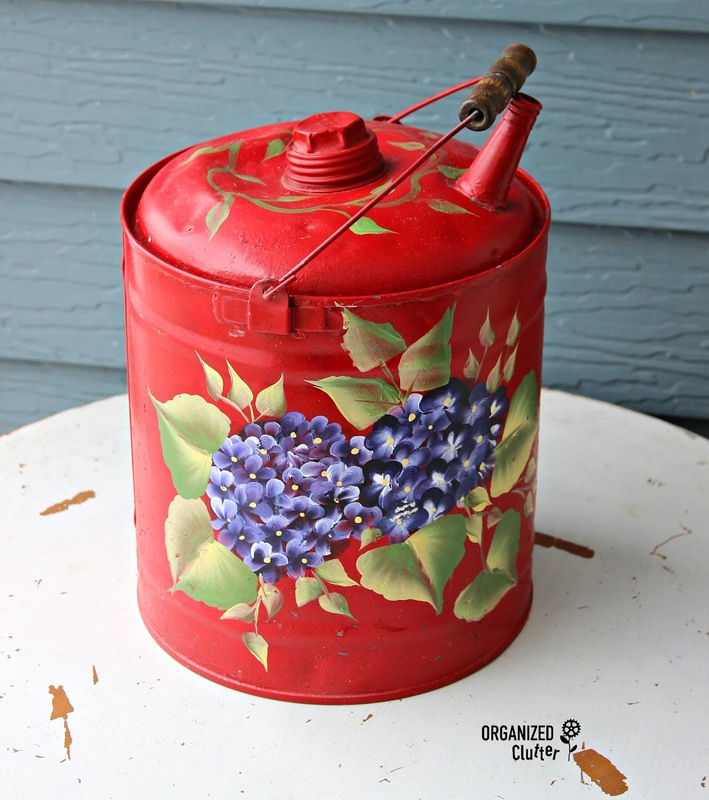 Hydrangeas hand painted on this side. And an iris on this side. 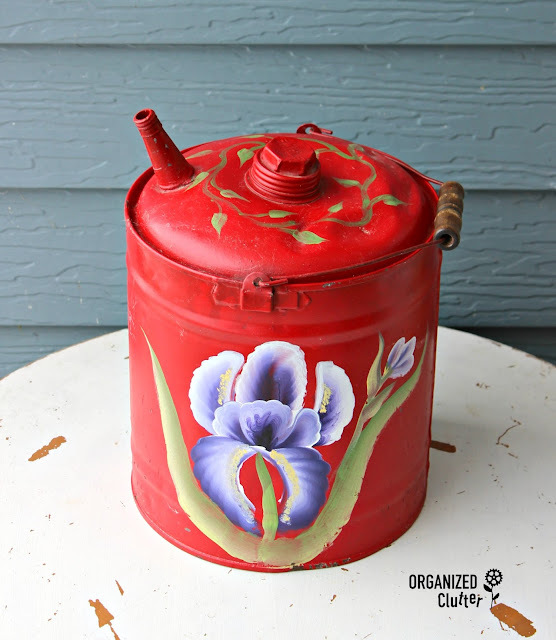 Whoever painted the oil can is a pretty good artist. 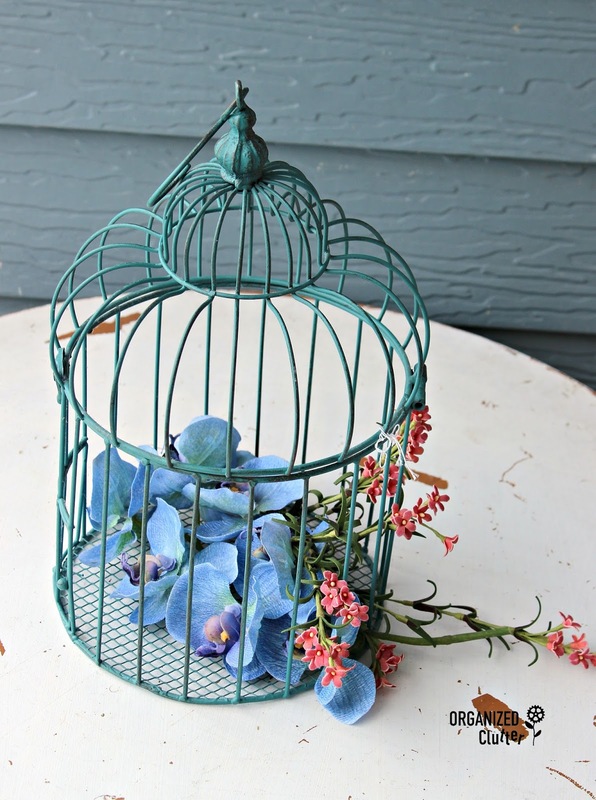 I purchased this wire decorative birdcage. I see a paint job coming. No teal in my house. I found these two wooden boxes. 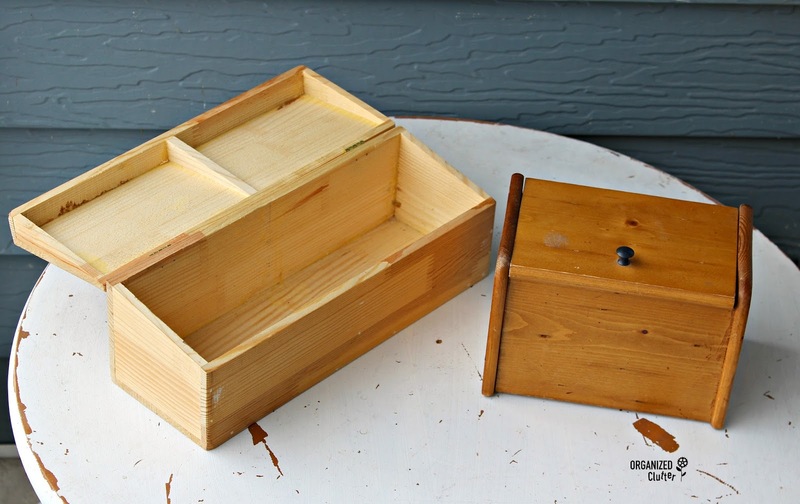 One has never been stained or painted, and the other is a recipe box. 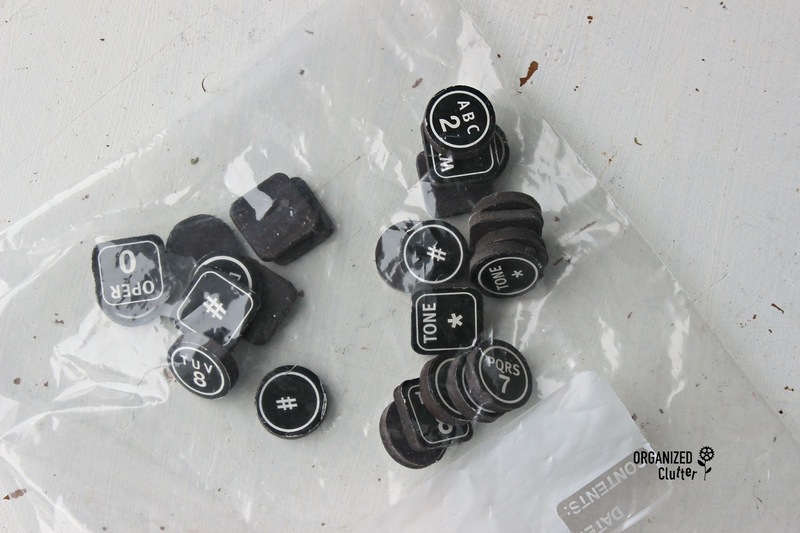 I found these telephone button magnets in a Baggie. They would be cute with a message board. I left this wire fencing I purchased out in the snow to further rust by spring. I like these little edging pieces rusty! 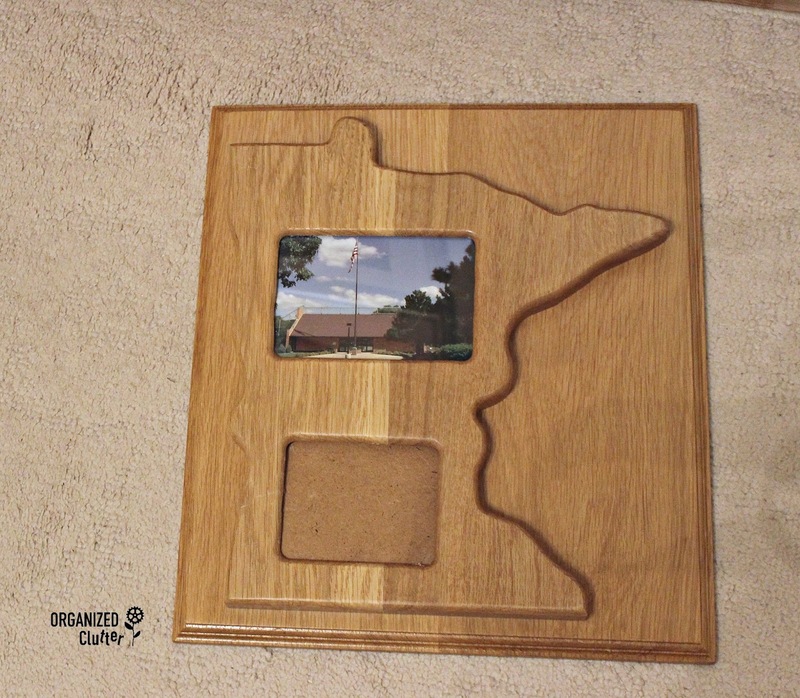 And I bought this Minnesota frame/plaque. It has two photo openings but one is missing the glass. 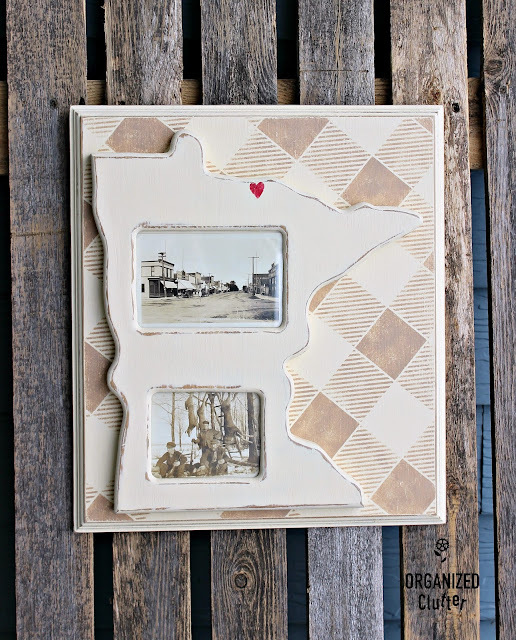 So my first upcycle/repurpose project from the items above is the Minnesota frame/plaque. My first step was to unscrew the Minnesota cutout from the back plaque. After getting it apart, I found that the top glass was plexi-glass. I had a piece of glass cut for both openings at the lumber yard. It cost me $3.50. Then I painted the two pieces with Rustoleum Chalked Light Tint Base mixed as Vintage Ivory . I really like Chalked, as a cheaper alternative to Annie Sloan Chalk. After the base coats dried, I pulled out my *Old Sign Stencils Buffalo Check stencil. 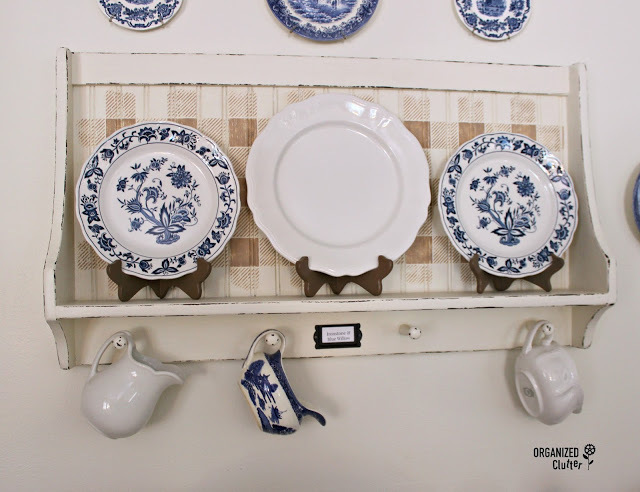 I taped it onto the plaque part with blue painter's tape on a diagonal. I used Ceramcoat Acrylic Paint in Trail Tan with a Dreamweaver Brush to stencil on the buffalo checks. It's fairly easy to move the stencil up an down and side to side to fill in the whole area. 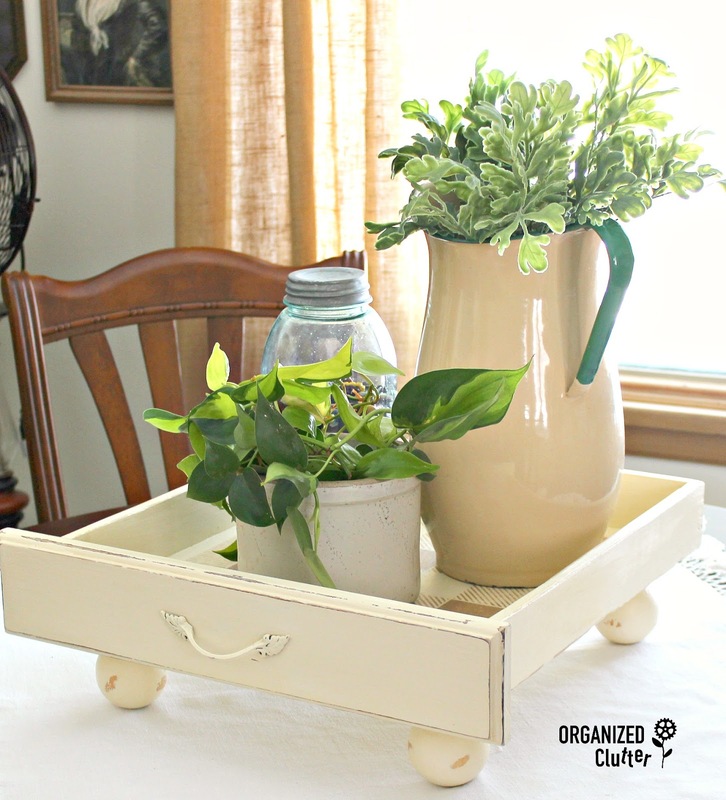 Just be sure to get it lined up correctly with your first stenciled area. To finish up my project, I sanded both pieces with 220 grit sandpaper. I press harder on the edges to reveal the previous finish, and lighter in the center areas, just smoothing out any brush strokes. I sealed the project with Varathane Crystal Clear Water-Based Polyurethane in a Satin Finish. Chalked paint has a similar product that is recommended as a sealer, Chalked Ultra Matte Clear Coat. 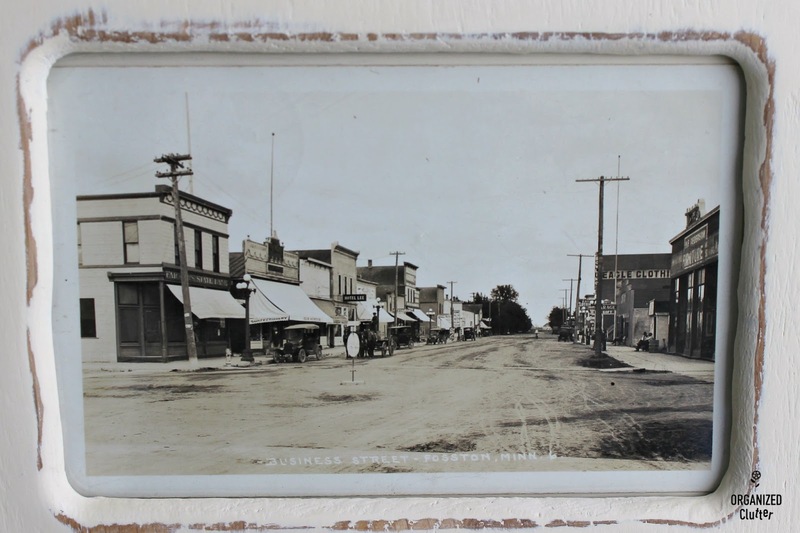 I added an old "Business Street" post card from Fosston, Minnesota. If I ever find one like this from International Falls, I may change it. 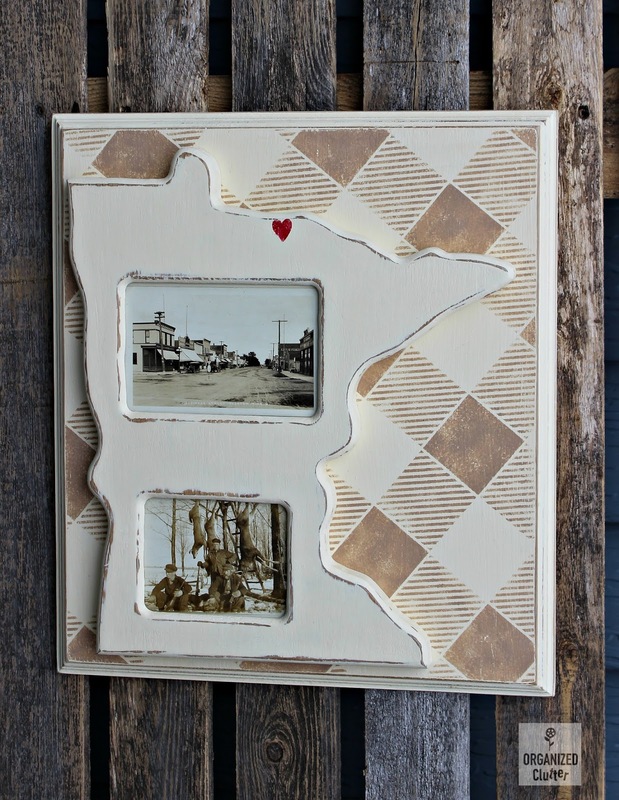 My family is from the Bagley, Fosston, Clearbrook area of Minnesota. This photo is from 1916. The Minnesota deer hunters in the photo include my great great grandfather (with the beard). I added a heart for my hometown. 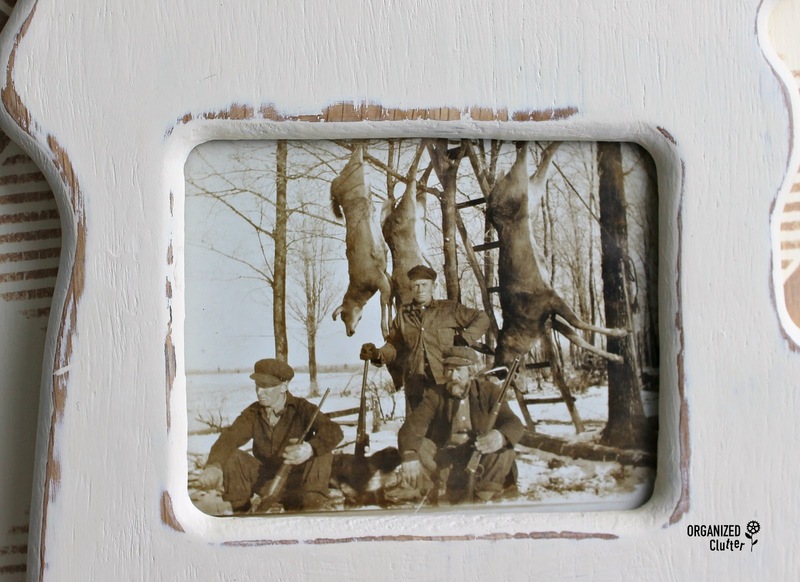 I'm thinking I will hang this in my living room, along with the other trail tan buffalo check pieces. That's really cute Carlene! 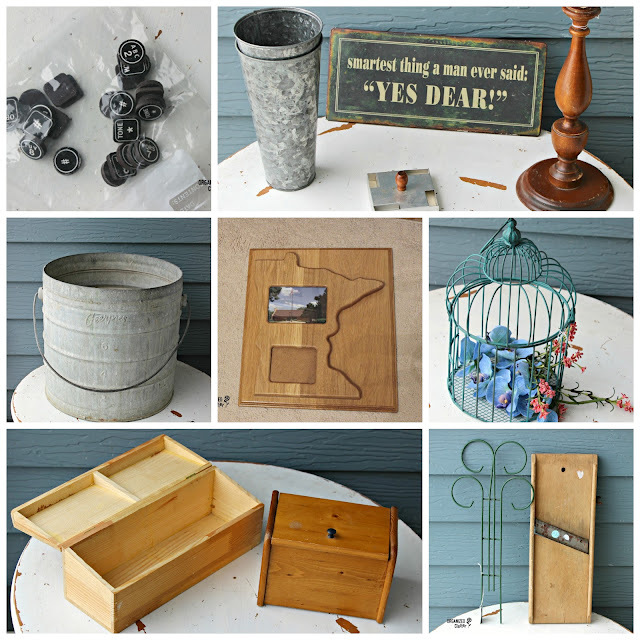 I like how you did the Minnesota plaque, and you got some great finds too! I wouldn't say that was slim pickins! Sweet! Love seeing what you collect, however that little map frame makeover stole my heart... what a neat way to display special mementos of a loved area!